Occupy Sandy Staten Island hasn't added a story. Occupy Sandy Staten Island has been on the ground here helping in relief and recovery since Superstorm Sandy battered the island late October. Partnering with other Staten Island non-profits and recovery organizations like Feeding Family & Boots on the Ground, we now work side by side for island relief and recovery. But we still need your help, now more than ever to continue our efforts in assisting those affected by Sandy. Every dollar, every cent is a tax deductible contribution that truly counts as so many residents continue to struggle to rebuild their homes and their lives. Occupy Sandy Staten Island hasn't posted any updates yet. 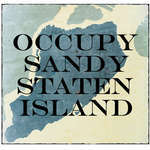 Occupy Sandy Staten Island is managing the funds for this campaign.